Over the past 12 months, Allen Francis, MD, has published a series of often controversial commentaries on the DSM revision process in the media, via Psychiatric Times website and yesterday, on the site of Psychology Today. Dr Frances had been chair of the DSM-IV Task Force and of the department of psychiatry at Duke University School of Medicine, Durham, NC. He is currently professor emeritus at Duke. I have had a comment published, this morning, in response to his latest piece on Psychology Today. The next steps need help from the field and public. Submitted by Suzy Chapman on April 13, 2010 – 3:24am. I would like to thank Dr Frances for his commentaries around the DSM revision process. I hope he won’t mind my highlighting that draft proposals are out for review until Tuesday, 20 April – so there is another week during which health professionals, researchers, patient organisations and the lay public can input into the review process. For some time now, professionals in the field, interest groups and the media have voiced concerns that the broadening of criteria for some DSM-5 categories would bring many more patients under a mental health diagnosis. But if the draft proposals of the “Somatic Symptom Disorders” Work Group were to be approved there will be medical, social and economic implications to the detriment of all patient populations and especially those bundled by many within the field of liaison psychiatry and psychosomatics under the so-called “Functional Somatic Syndromes” (FSS) and “Medically Unexplained Syndromes” (MUS) umbrellas, under which they include Chronic fatigue syndrome, ME, Fibromyalgia, IBS, chemical injury, chemical sensitivity, chronic Lyme disease, GWS and others . There is considerable concern amongst international patient organisations for the implications of the “Somatic Symptom Disorders” Work Group proposal for combining Somatoform Disorders, Psychological Factors Affecting Medical Condition (PFAMC), and Factitious Disorders under a common rubric called “Somatic Symptom Disorders” and for the creation of a new classification, “Complex Somatic Symptom Disorder” (CSSD). They are particularly concerned for patients living with conditions characterised by so-called “medically unexplained symptoms” or with medical conditions for which diagnostic tests are currently lacking that provide evidence substantiating the medical seriousness of their symptoms and the need for provision of appropriate medical investigations, treatments, financial and social support, and in the case of children and young people, the putting in place of arrangements for the education of children too sick to attend mainstream school. “To meet criteria for CSSD, criteria A, B, and C are necessary. (1) High level of health-related anxiety. (3) A tendency to assume the worst about their health (catastrophizing). To date, there has been little public discussion by professionals or the media of the medical, social and economic implications for patients of the application of an additional diagnosis of “Complex Somatic Symptom Disorder”. With a week to go before this initial public review period closes there is still time and I urge professionals and stakeholders to scrutinise the proposals of the “Somatic Symptom Disorder” Work Group and to submit their concerns to the Task Force. The DSM-5 public review period runs from 10 February to 20 April. Members of the public, patient representation organisations, professionals and other end users can submit responses, online. Please take this opportunity to register comment and to alert and encourage professionals and international patient organisations to participate. The Alpha Draft for ICD-11 is scheduled for May 2010. 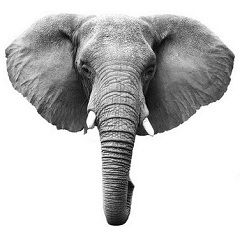 I shall be posting again shortly around the ICD-11 revision process. The Diagnostic and Statistical Manual for Mental Disorders (DSM) is being revised by the American Psychiatric Association for release in 2013. Creation of a new category called “Complex Somatic Symptom Disorder” has generated concern and the CFIDS Association submitted its statement on April 1. In response to an open request for input on proposed changes to the fifth revision of the Diagnostic and Statistical Manual of Mental Disorders (DSM), the CFIDS Association of America submits the following statement and urgent recommendation. To meet criteria for CSSD, criteria A, B, and C are necessary. (4) Belief in the medical seriousness of their symptoms despite evidence to the contrary. C. Chronicity: Although any one symptom may not be continuously present, the state of being symptomatic is chronic and persistent (at least six months). (http://www.dsm5.org/about/Pages/faq.aspx, accessed March 28, 2010). This is especially true with regard to patients coping with conditions characterized by unexplained medical symptoms, or individuals with medical conditions that presently lack a mature clinical testing regimen that provides the evidence required to substantiate the medical seriousness of their symptoms. For instance, all of the case definitions for CFS published since 1988 have required that in order to be classified/diagnosed as CFS, symptoms must produce substantial impact on the patient’s ability to engage in previous levels of occupational, educational, personal, social or leisure activity. Yet, all of the case definitions rely on patient report as evidence of the disabling nature of symptoms, rather than results of specific medical tests. So by definition, CFS patients will meet the CSSD criteria A and C for somatic symptoms and chronicity, and by virtue of the lack of widely available objective clinical tests sensitive and specific to its characteristic symptoms, CFS patients may also meet criterion B-4. As drafted, the criteria for CSSD establish a “Catch-22” paradox in which six months or more of a single or multiple somatic symptoms – surely a distressing situation for a previously active individual – is classified as a mental disorder if the individual becomes “excessively” concerned about his or her health. Without establishing what “normal” behavior in response to the sustained loss of physical health and function would be and in the absence of an objective measure of what would constitute excessiveness, the creation of this category poses almost certain risk to patients without providing any offsetting improvement in diagnostic clarity or targeted treatment. To provide another common example, back pain that is debilitating and severe, with negative MRIs, is still debilitating and severe back pain. A patient in this situation might be concerned about this back pain, might view it as detrimental to his quality of life and livelihood, and might direct time and resources to seeking care from multiple specialists (e.g., neurology, rheumatology, orthopedics, rehabilitation) to relieve it. Each of these specialists is likely to recommend slightly different therapies, compounding the patient’s focus on alternative explanations for and long-term impact of decreased function and diminished health. 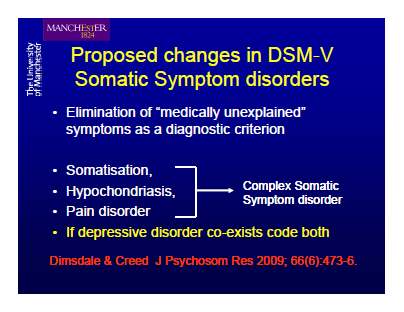 Such a patient could be diagnosed with CSSD, yet no empiric evidence has been provided by the Somatic Symptoms Disorders Work Group that applying the label of CSSD will facilitate communication with the patient, add clinical value to the patient’s experience, or improve the care any of these various specialists might provide. (http://www.dsm5.org/ProposedRevisions/Pages/proposedrevision.aspx?rid=368, accessed March 28, 2010), further limiting the usefulness of this classification in a manual written primarily for the benefit of mental health professionals. as “somatic presentations of mental disorders.” None of the research and/or clinical criteria for chronic fatigue syndrome published since 1988 have established CFS as a mental disorder and a continuously growing body of literature demonstrates CFS to be a physiological disorder marked by abnormalities in the central and autonomic nervous systems, the immune system and the endocrine system. The role of infectious agents in the onset and/or persistence of CFS has received renewed attention since the DSM-5 revision process began in 1999. Most recently, the October 2009 report of evidence of a human retrovirus, xenotropic murine leukemia-related retrovirus (XMRV), in CFS patients in Science (Lombardi, 2009) has generated new investigations into this and other infectious agents in CFS. The conceptual framework for CFS detailed in the “Clinical Working Case Definition, Diagnostic and Treatment Protocols” (Carruthers, 2003) serves as a useful tool for professionals to establish a diagnosis of CFS, address comorbidities that may complicate the clinical presentation and distinguish CFS from conditions with overlapping symptomotology. Research on CFS continues to explore and document important biomarkers. Lack of known causation does not make CFS – or the CFS patient’s illness experience – psychopathological any more than multiple sclerosis, diabetes, or other chronic illnesses with objective diagnostic measures, would be so considered. For the reasons stated above and the general failure of the proposed creation of the CSSD to satisfy the stated objectives of the DSM-5 without risking increased harm to patients through confusion with other conditions or attaching further stigma, the CFIDS Association strongly urges the DSM-5 Task Force to abandon the proposed creation of CSSD. The DSM-5 public review period runs from 10 February to 20 April, so there are just over six weeks during which stakeholders in DSM-5 – that’s members of the public, patient representation organisations, professionals and other end users can submit their responses. Please take this opportunity to submit a response and to alert and encourage professionals and international patient organisations to participate. Key links are provided at the end of this posting. The following UK organisations have so far been silent on the DSM-5 proposals. Go here to read Mary M. Schweitzer’s Submission to the Work Group for Somatic Symptom Disorders. These provide an overview of the new proposals and revisions and a “Justification of Criteria” rationale document. I would recommend downloading these if intending to make a submission.